Cryoballoon (CB) has emerged as a reasonable alternative to radiofrequency for treatment of paroxysmal atrial fibrillation (AF) due to simple operation, short learning curve, less patient discomfort, shorter ablation time, etc., However, the second-generation CB had a higher probability than the first-generation CB in the phrenic nerve injury (PNI) mostly observed in freezing the right superior pulmonary vein. Few reports on the CB ablation for a refractory AF originating from superior vena cava.what's more,It is rare to publish Phrenic Nerve Injury(PNI) is occurred in CB ablation for AF from SVC,the case is about it. Catheter ablation of pulmonary veins (PVs) is a curative treatment option for patients with symptomatic drug-refractory paroxysmal atrial fibrillation (AF) aiming at elimination or significant reduction of the AF burden., Catheter ablation of AF using the cryoballoon (CB) has emerged as an alternative approach to point-by-point radiofrequency ablation for its simplicity and efficiency gradually. Phrenic nerve injury (PNI) is the most frequently observed complication during CB ablation., This adverse event is mostly observed during cryotherapy applications in the right superior PV, but it also can occur during cryoablation in the right inferior PV. The second-generation CB has been associated with a higher incidence of PNI compared with the first-generation CB. It was reported that 6%–12% of paroxysmal AF and 20% recurrent AF after circumferential PV isolation were originating from superior vena cava (SVC)., To the best of our knowledge, this is the first to report the successful focal ablation of a type of refractory AF originating from SVC with PNI duration cryoablation. 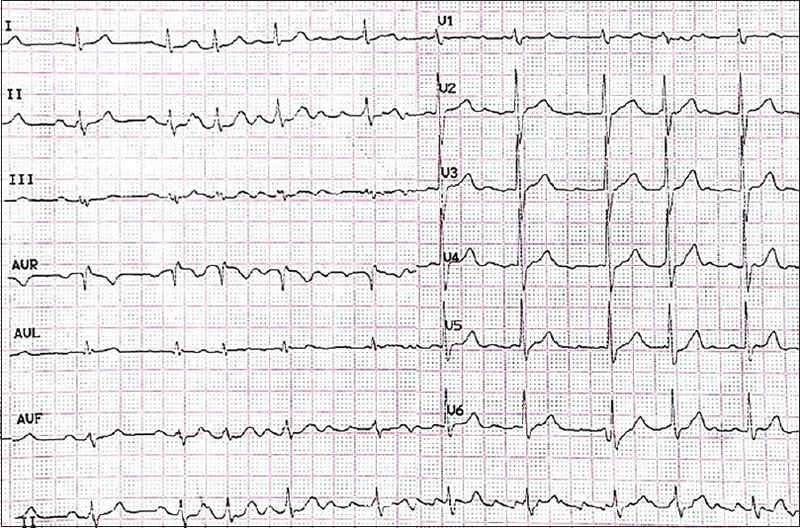 We report a 63-year-old male with a 6-year history of palpitation, limited exercise capacity, and shortness of breath. The patient was first diagnosed with symptomatic AF [Figure 1]. Antiarrhythmic drugs had failed to control the arrhythmia or ventricular response rate: metoprolol (25 mg/d in 2 equal doses for 8 weeks) and propafenone (450 mg/d in three equal doses) had been given for 2 months. All antiarrhythmic medications were discontinued for at least five half-lives, and the patient was taken to the electrophysiology laboratory. The transseptal sheath was exchanged over a guide wire for a 15-Fr steerable sheath (Flexcath Advance, Medtronic Inc., Minneapolis, MN, USA). A spiral mapping catheter (Achieve, Medtronic Inc.) was used to advance the second-generation 28-mm CB (Arctic Front Advance, Medtronic Inc.) into the PV for support and to map the PV potentials. A contrast medium was used to verify the complete occlusion of the PV ostium, which was followed by a freeze cycle of 180 s. No additional applications were performed after the isolation. The order of the CB ablation (CBA) was the left superior PV, left inferior PV, right superior PV, and right inferior PV [Figure 2]. A 28-mm diameter balloon was used in the patient. During right PV CBA application, the right phrenic nerve had been continuously paced from the SVC. If the strength of diaphragmatic contraction decreased, CB application was immediately stopped. After successful PV isolation with CBA procedure, the sinus rhythm could not be maintained after electrical cardioversion [Figure 3]. Subsequently, a mapping catheter was placed in the SVC to map the origin of the AF. 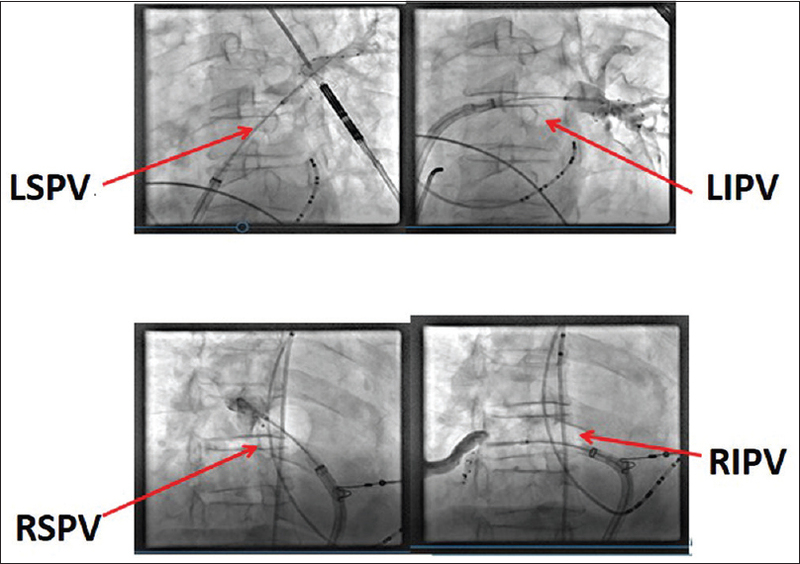 A circular mapping catheter was placed in the SVC, where large and high-frequency signals were recorded [Figure 4]. 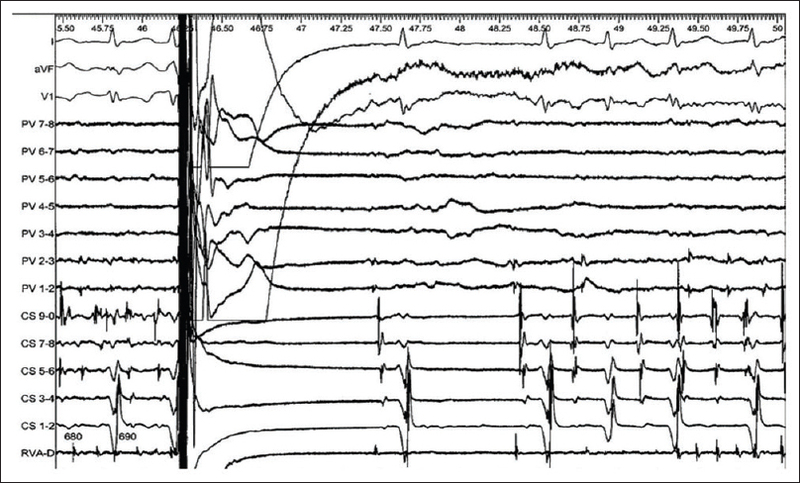 Burst rapid foci activity within SVC still remained in the patient in the presence of sinus rhythm restoration after SVC isolation (SVCI) by a freeze cycle of 30s for the first time [Figure 5]. To isolate the potential of SVC completely, it is ablated once again. Finenally, the SVC potential was isolated after the temperature of CBA is reduced to 41°C [Figure 6]. To avoid bilateral PNI, high-output right phrenic nerve stimulation (20–25 mA, 1,200 ms) was carried out as a diagnostic catheter placed in the SVC during cryoablation of the right PVs and SVC. 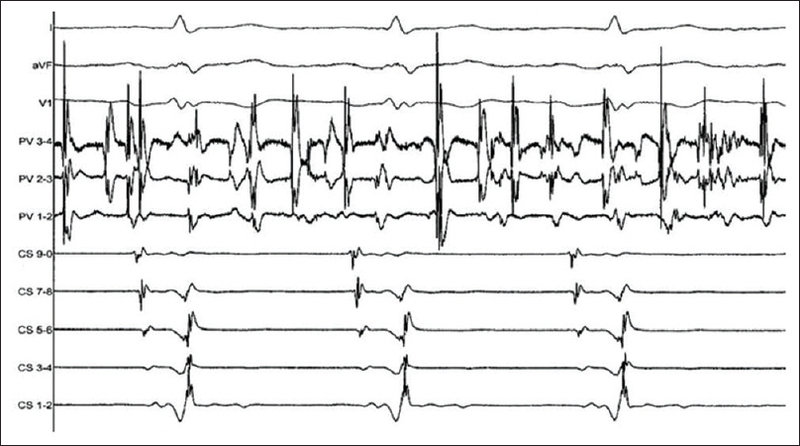 The rhythm after the ablation was sinus rhythm and we did not observe any AF during the postprocedural follow-up. For the evaluation of PNI, a chest X-ray was undertaken in a standing position 1 day before and the next day after the ablation procedure in the patient. The level of the right diaphragm was obviously elevated on the next day of the procedure compared with that before the procedure; we diagnosed it as PNI [Figure 7]. The patient with PNI whose symptom was mainly manifested as exertional dyspnea showed right diaphragm elevation on the chest X-ray film at 1-month follow-up after the procedure. However, the patient recovered from PNI within 6 months. Ablation strategies of AF are still under discussion owing to the complexity of arrhythmogenesis. Triggering and driving sources are not limited to a PV origin but may be linked to other vascular structures, such as the coronary sinus, SVC, and in some rare cases, a persistent left SVC. Corrado et al. reported in their randomized controlled study that the patients who underwent SVCI as an adjunctive therapy to PV isolation had significantly lower recurrence rate of AF than those who underwent only PV isolation. The present report underlines that the musculature structures of SVC may play an important role in arrhythmogenesis. Anatomically, the course of the right phrenic nerve is much closer to the SVC than the right superior PV, thus PNI is a specific concern during SVCI. 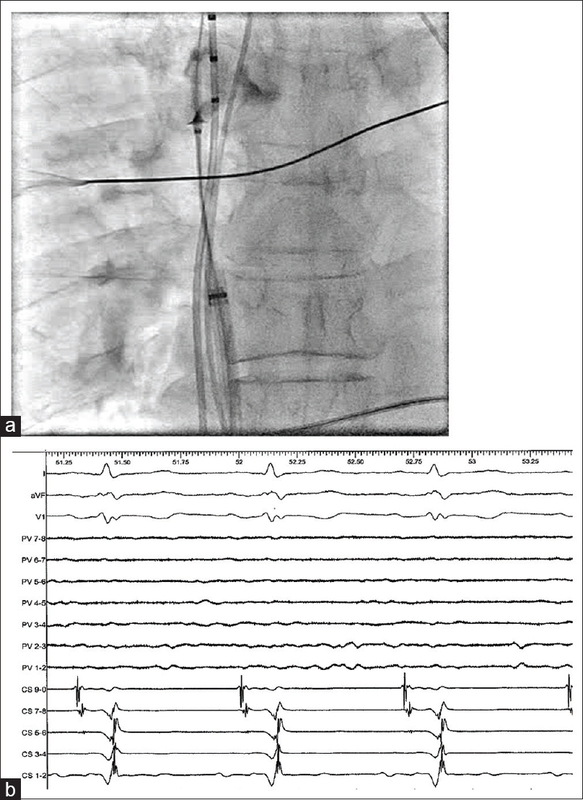 Right phrenic nerve and sinus node injuries were major complications of SVCI, especially at the time of delivering radiofrequency energy at the free wall of SVC. Therefore, knowing how to minimize this complication during SVCI is clinically important. A recent study showed that the fluoroscopic assessment of the diaphragm movement during spontaneous breathing is more sensitive for detecting PNI compared with SVC pacing during CBA. Although this technique is not applicable in patients under general anesthesia, constant phrenic nerve pacing and monitoring of compound motor action potential recordings would be helpful when radiofrequency energy is applied at sites close to the phrenic nerve as well as during CB ablation. The second-generation CB has been shown to be associated with a higher incidence of PNP compared with the first-generation CB. The arrhythmogenic foci are known to originate not only from the four PVs but also from the SVC. Therefore, it is necessary for us to isolate the SVC. Moreover, we have done something to avoid the PNI, for example, the high-output right phrenic nerve stimulation (20–25 mA, 1200 ms) was carried out using a diagnostic catheter placed in the SVC and the right PVs. In addition, more attention should be paid to the SVC when we decide to perform SVC ablation. A spiral mapping catheter should be used to identify the location, height, and direction of the arrhythmogenic foci according to the surface electrocardiography firstly. According to the imaging information before the ablation, the anatomy between the phrenic nerve and the SVC is clear, therefore, the position and direction of the CB should be adjusted to the place far from the phrenic nerve. Another potential complication of CB ablation SVC is sinus node damage.some measures should be made to avoid its appearance, for example, a spiral mapping catheter should be used to identify the location of the sinus node to reduce the possibility of sinus node damage. In a word, it is cautious for us to try to use the CB for isolation in the SVC. Some measures as above should be taken into considerations before the treatment to reduce complications as possible. Cappato R, Calkins H, Chen SA, Davies W, Iesaka Y, Kalman J, et al. Updated worldwide survey on the methods, efficacy, and safety of catheter ablation for human atrial fibrillation. Circ Arrhythm Electrophysiol 2010;3:32-8. Calkins H, Reynolds MR, Spector P, Sondhi M, Xu Y, Martin A, et al. Treatment of atrial fibrillation with antiarrhythmic drugs or radiofrequency ablation: Two systematic literature reviews and meta-analyses. Circ Arrhythm Electrophysiol 2009;2:349-61. Neumann T, Vogt J, Schumacher B, Dorszewski A, Kuniss M, Neuser H, et al. Circumferential pulmonary vein isolation with the cryoballoon technique results from a prospective 3-center study. J Am Coll Cardiol 2008;52:273-8. Andrade JG, Khairy P, Guerra PG, Deyell MW, Rivard L, Macle L, et al. Efficacy and safety of cryoballoon ablation for atrial fibrillation: A systematic review of published studies. Heart Rhythm 2011;8:1444-51. Packer DL, Kowal RC, Wheelan KR, Irwin JM, Champagne J, Guerra PG, et al. Cryoballoon ablation of pulmonary veins for paroxysmal atrial fibrillation:First results of the North American arctic front (STOP AF) pivotal trial. J Am Coll Cardiol 2013;61:1713-23. Fürnkranz A, Bordignon S, Schmidt B, Perrotta L, Dugo D, De Lazzari M, et al. Incidence and characteristics of phrenic nerve palsy following pulmonary vein isolation with the second-generation as compared with the first-generation cryoballoon in 360 consecutive patients. Europace 2015;17:574-8. Liu H, Lim KT, Murray C, Weerasooriya R. Electrogram-guided isolation of the left superior vena cava for treatment of atrial fibrillation. Europace 2007;9:775-80. Corrado A, Bonso A, Madalosso M, Rossillo A, Themistoclakis S, Di Biase L, et al. Impact of systematic isolation of superior vena cava in addition to pulmonary vein antrum isolation on the outcome of paroxysmal, persistent, and permanent atrial fibrillation ablation: Results from a randomized study. J Cardiovasc Electrophysiol 2010;21:1-5. Linhart M, Nielson A, Andrié RP, Mittmann-Braun EL, Stöckigt F, Kreuz J, et al. Fluoroscopy of spontaneous breathing is more sensitive than phrenic nerve stimulation for detection of right phrenic nerve injury during cryoballoon ablation of atrial fibrillation. J Cardiovasc Electrophysiol 2014;25:859-65. Franceschi F, Dubuc M, Guerra PG, Delisle S, Romeo P, Landry E, et al. 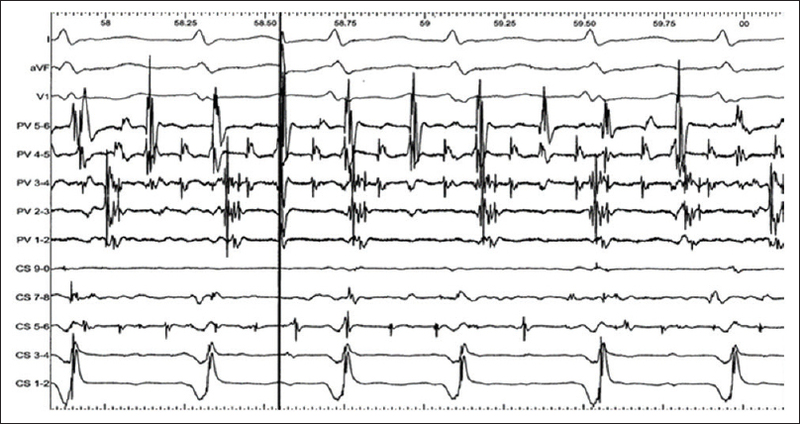 Diaphragmatic electromyography during cryoballoon ablation: A novel concept in the prevention of phrenic nerve palsy. Heart Rhythm 2011;8:885-91.